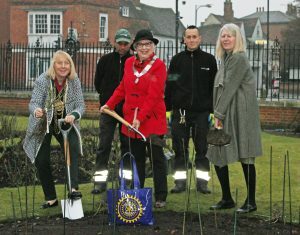 Colchester Castle Park has been generously donated 39 roses by Inner Wheel Clubs from across Inner Wheel District 24 that encompasses most of Essex, a little bit of Hertfordshire and Havering. The roses, ‘Inner Wheel Forever’, are a perfumed, pink, long season floribunda with disease resistant foliage, bred by Rosa Esklund and now being grown in this country by Thompson and Morgan at Ipswich. Every rose sold also generates funds for Inner Wheel charities. 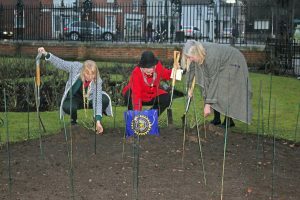 The roses will be positioned in a prominent position within the Castle Park and will be commemorated by a plaque at a later date. 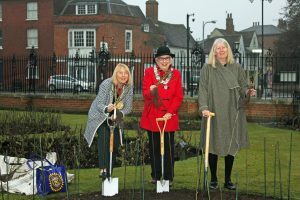 The ceremonial planting took place at 2.45pm on Tuesday 13 December 2016. 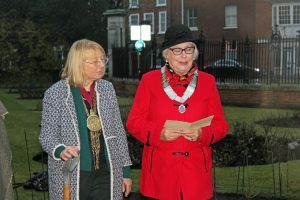 Councillor Annie Feltham, Portfolio Holder Business, Leisure and Opportunities said: “Colchester Borough Council is extremely grateful for such a generous gift to Castle Park by Inner Wheel, who do such fantastic work to support projects in the local community. Inner Wheel is a women’s voluntary service organisation now active in 104 countries worldwide, supporting projects in local communities and beyond. Colchester has two Inner Wheel Clubs. Janet Larkey, Chairman of the District Team of The Association of Inner Wheel Clubs said: “As a women’s voluntary service organisation, Inner Wheel has been quietly making a difference in local communities and beyond for more than 90 years. We are delighted to be able to make this gift of roses that will, over many years, give pleasure to passers-by whilst reminding them of the value of volunteers in all communities”.